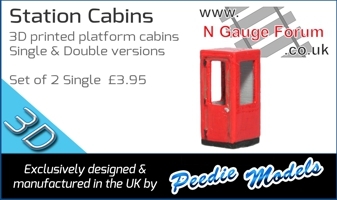 Any chance of the battery box/underframe part being listed separate ? pm the guy who designed it and ask him. Just received this from my model maker. The BO End bogie side frames have been put on, I was given some Ian Stoate CO BO bits which included the tanks, so I'm using those until the replacement 3D printed tanks and CO end side frames arrive. 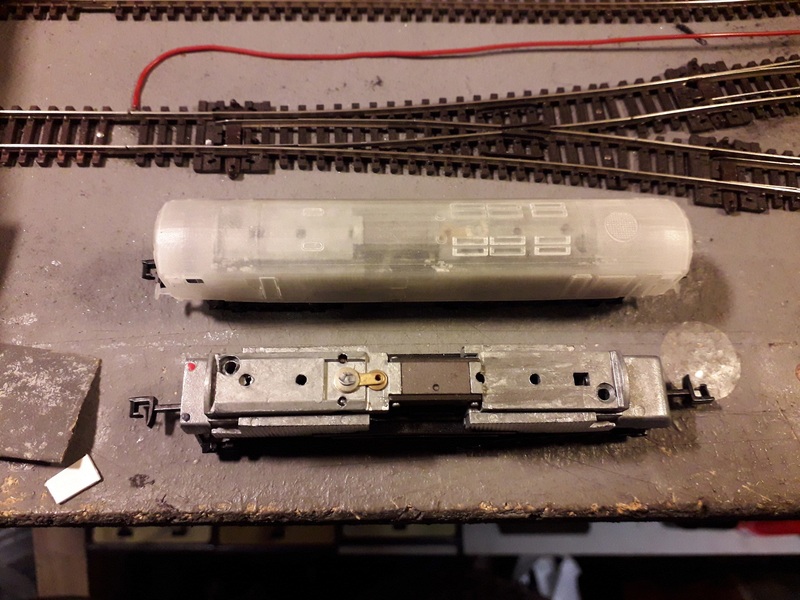 I have been working on a pair of CO-BO's and just got the chassis to fit, then found that the couplings were too short due to the body overhanging the bogies by some distance. @mark100 suggested using BH enterprises extra long whitemetal couplings but although longer, I found that they cause buffer locking on 12 inch radius points (medium radius to you) a certain amount of head scratching followed by a flash of inspiration, why not try the extra long couplings that came with the early Dapol autocoaches? so I robbed one coach of its couplings and attached them to one of the Co-Bo chassis and tried again. result? SUCCESS! Going great Alex. I think you tried to explain this to me on Wednesday but you were interupted by another pint arriving. Are the couplings NEM ? as I don't want to rob your Auto coach as again thanks to your Tracksetta I have 15" minimum radii. The early Autocoach couplings were not NEM. The later Autocoach couplings were - and those bogies are now shared with the Siphons which is why the siphons have such a horrendous gap between them. A little progress made, but I am not yet satisfied with the bodies, a little more sanding and filling to be done, but I couldn't resist trying them out, so out came the Conflats and the Condor rides again! Been following this with interest. Appearing shortly on Steinheim am Main, a non-motorised Co-bo which sits on a rolling chassis. 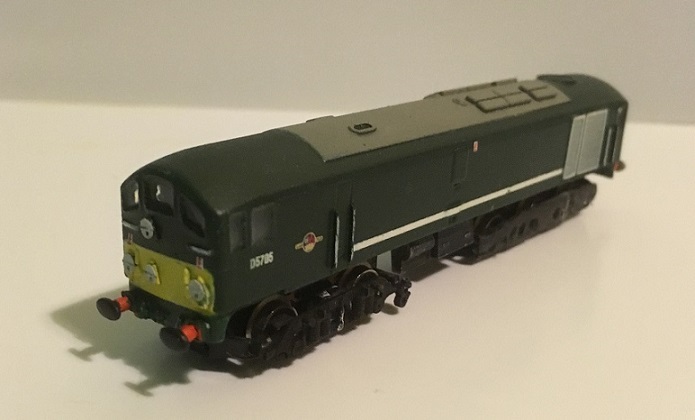 The plan is that it will run with a companion locomotive, probably a two-tone green class 24. I know they could not operate in multiple, but you do see photos of a Co-bo working with a second engine - including a steam engine - if, for example, the steam heat boiler had failed. 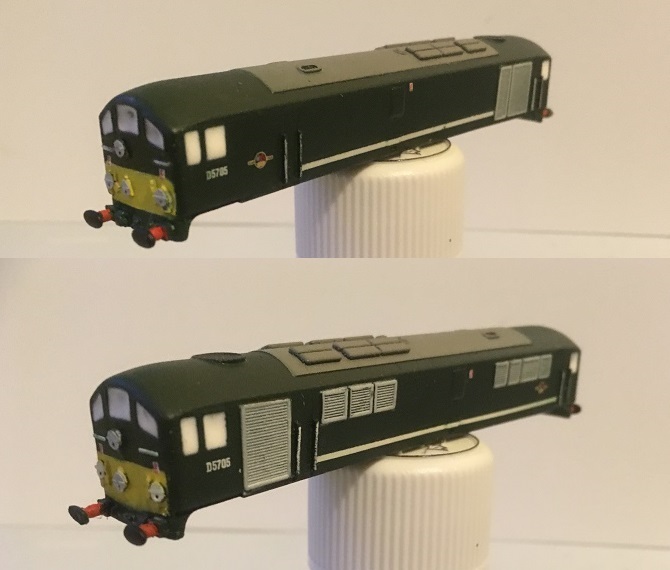 The project will have to pause now, as I'm awaiting some long shank Rapidos from Shapeways before I finish the bogies and attach the side frames. I have not been on the forum for a while so missed this. 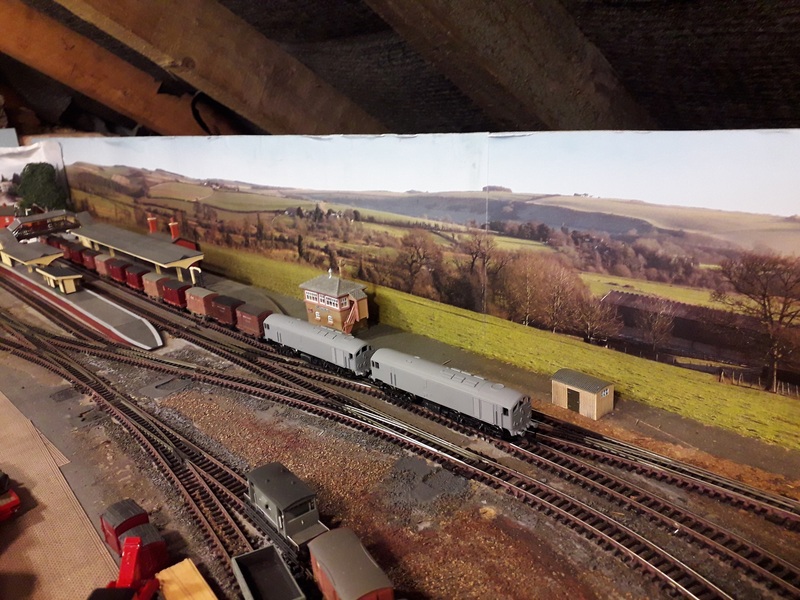 Must say, they are looking great Alex, still I now will have to get my layout ready for the arrival even if it means buying a few dozen more conflats. So... my take on the Shapeways Co-Bo as painted and decalled by AEM. 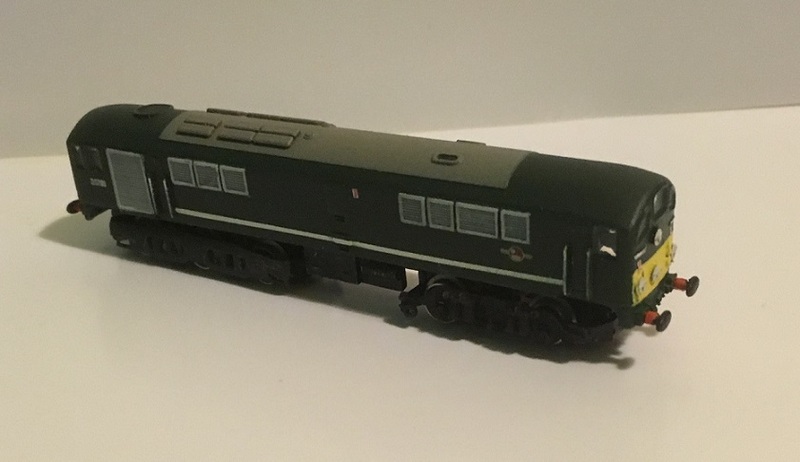 It sits on a rolling chassis made up from Farish spares from BR Lines, with the Shapeways bogie sides attached to the (hacked about) Farish bogies. 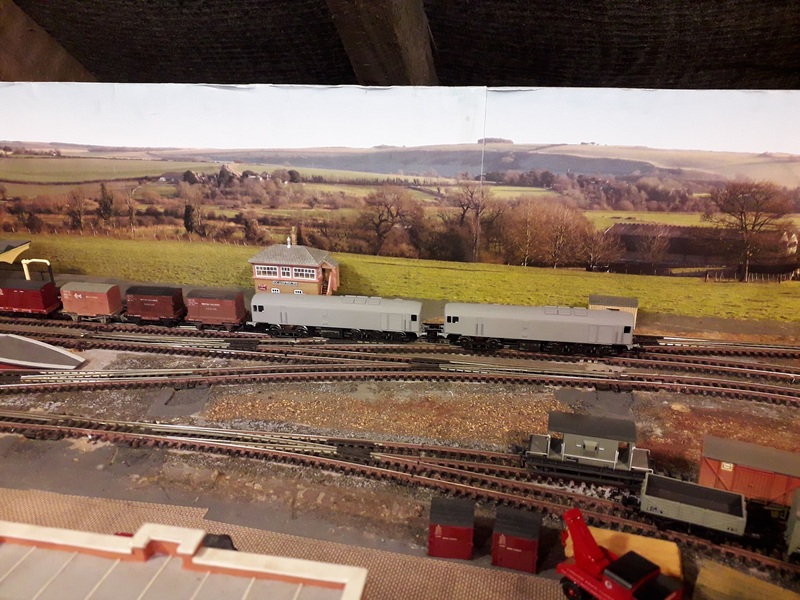 I'm not entirely happy with what I've done, especially at the "Co" end, as ideally the bogie sides should be closer in to the wheels; I'm wondering whether to have another go. Taken from this view, it also looks a tad high, which is a little frustrating as I spent ages trying to get everything to sit level and buffer up correctly. Couplings are long shank 3D printed ones (Shapeways again); I'm wondering if it's practical to paint them black? Would welcome any thoughts from more experienced builders; this is the first time I've attempted anything like this.